Thank you, Ivan Fountain & Mr. Taylor for meeting with us today to view the median curb issues. We appreciate your time & prompt response. We also appreciate your letting us know that fixes on our curbs that can be made will be placed in line for not immediate but future remediation. We understand & appreciate that they are in the "to do" list. Thanks, too, for putting us in line for redo of painting of curbs & bicycle/walking lanes. Water does not drain to storm drain. 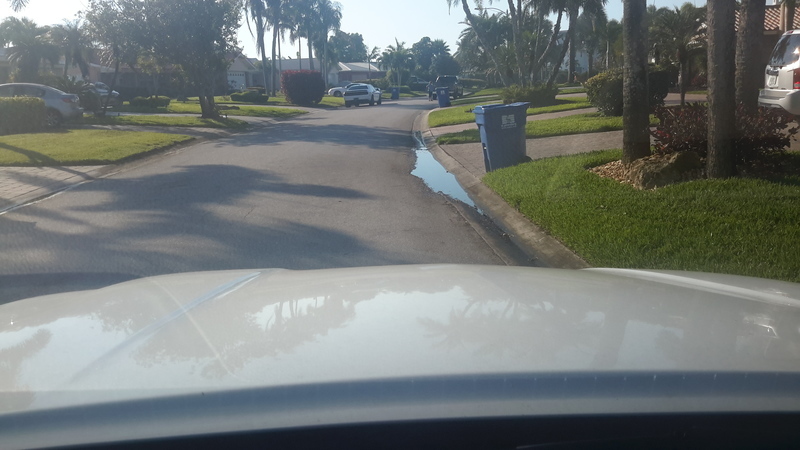 The City installed some asphalt last year but there needs to be more build up to move the water to the drain. Thank you, Mayor's Action Center. When I walked by this morning, it was holding water. Address of house is 7809. Open hole in asphalt road. Has been open for months. A work order has been issued to a Stormwater Crew. Thank you. The curb in front of 2-3 properties has been damaged from large trucks driving over it repeatedly. Water is unable to drain properly. Ever since the sanitary sewer line was cleaned out the round lid in the road goes clickety clack real loud every time a vehicle drives over it. Going on 3 weeks & still nothing has been done. Tree and yard waste piled in front yard for several weeks. or call 727-893-7373 and refer to the above case numbers or the property address. The curb is deteriorated at the corner of the driveway and cracked and chunks of the cement lay in the curb. Several people including my elderly mother has tripped getting out of vehicles and fallen in the street. The codes compliance officer needs to take a drive on every street in Yacht Club Estates. Upon doing so, it will be found that on every street there is one or more utility trailers, boat trailers, boats on trailers, motor homes, and covered cars that may or may not have a current tag on it. There are simply too many to list here individually. When I tried to phone in several of these code violations, I was told that I can only report two on one call. Yacht Club properties are highly taxed. This code violation INFECTION that's gaining momentum can and will devaluate our properties. Please take the necessary action. Are your reporting an issue at 1037 79th Street S? Boat/RV/Trailer? Where is it located. Thank you for your help!